South Korean banks' capital adequacy ratios deteriorated in the third quarter amid rising household debts, a wobbling property market and poor earnings, industry sources and financial regulators said on Nov.9. The weakening financial health of local banks, including the nation's top lender, Kookmin Bank, will likely place an additional burden on the South Korean economy, which is reeling from the global financial crisis, analysts say. In the three months to September, Kookmin Bank saw its capital adequacy ratio under Bank for International Settlements (BIS) guidelines fall to 9.76 percent from 10.49 percent. It was the first time that Kookmin Bank's BIS capital ratio has declined below 10 percent since 2002. While financial regulators require commercial banks to keep more than an eight percent capital ratio, they recommend that lenders keep a ratio of 10 percent or above. The BIS capital ratio for Shinbank Bank, the nation's No. 3 lender, fell to 11.9 percent in the third quarter, from 12.5 percent a quarter earlier. Korea Exchange Bank, owned by U.S. private equity fund Lone Star, saw the ratio slip to 10.64 percent from 11.56 percent. "There are loads of risky factors for banks," said Daishin Securities analyst Choi Jeong-wook, noting that bad loans to builders, losses from foreign-currency option contracts and mounting household loans are all weighing on lenders at a time when the property market is cooling. "Over the next year, the banks should wage a battle against such risks," Choi said. Major banks also suffered a sharp decline in their third-quarter profits, adding to their woes. Kookmin Bank's third-quarter net profit fell 28.6 percent from a year earlier to 553.3 billion won (US$418 million). Shinhan Bank reported a 32.2 percent plunge in its third-quarter profit, bringing it to 214.3 billion won. On Friday, Moody's Investors Service cut its financial strength outlook on Korea Exchange Bank to "negative" from "stable," citing the "anticipated deterioration in its creditworthiness." 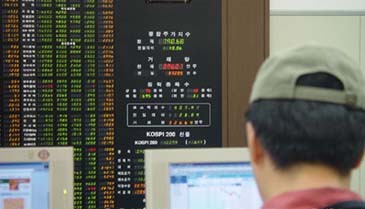 The downgrade came days after Korea Exchange Bank posted a 22 percent drop in its third-quarter profit.